Nanabah Foguth, a citizen of the Navajo Nation, recalls being unable to mail a letter at the post office last year because it was closed for Columbus Day. She said the holiday reminded her that many didn’t recognize the hypocrisy of honoring Christopher Columbus. Evanston joined a number of other cities last year by replacing Columbus Day with Indigenous Peoples’ Day. “Indigenous Peoples’ Day to me is an empowering identity, a spiritual identity and it means sharing that in a way that is in balance and harmony,” Foguth said. Foguth was one of three panelists who discussed their culture in honor of Indigenous Peoples’ Day at the Baha’i House of Worship in Wilmette on Monday. 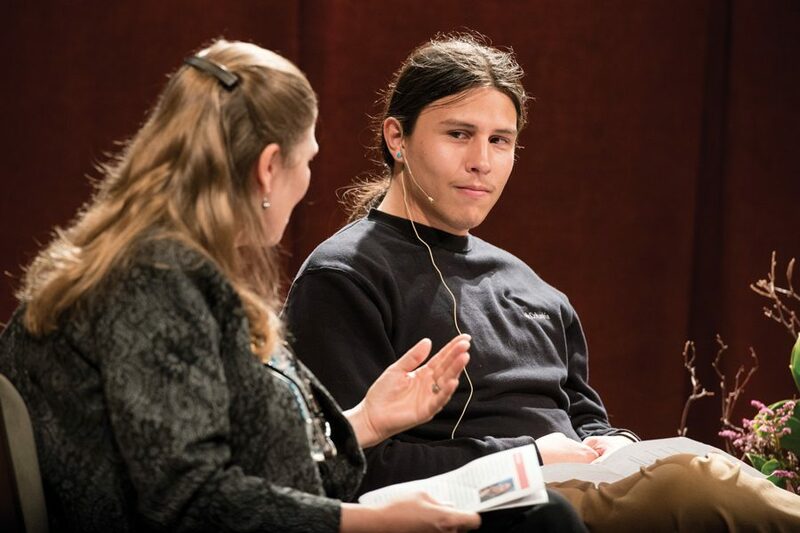 Jim DeNomie, a citizen of the Bad River Chippewa, and Forrest Bruce, a citizen of the Fond du Lac Band of Ojibwe, also spoke on the panel, which was sponsored by Northwestern’s new Center for Native American and Indigenous Research. Forrest Bruce (SESP ‘17) discusses his work with indigenous children in Chicago Public Schools. He said he encourages them to practice beading and language in addition to their schoolwork. “It’s important to have a day like this to sit down and talk about what lens you’re looking through and how you envision things and how they might not be correct,” DeNomie said. DeNomie told The Daily that the holiday should prompt people to examine Native American history — especially in Illinois, where there are no Native American reservations. Bruce (SESP ’17) said honoring a man who killed many Native Americans disrespected his people. He added that, like confronting the contradiction of Columbus Day, NU’s history of honoring John Evans is painful. In 2014, a study committee found that Evans, one of the university’s founders, “helped create a situation that made the Sand Creek Massacre possible.” About 150 Native Americans were killed in the 1864 massacre. Bruce said the University is trying to reconcile that history, and he thinks there is a “bright future ahead” for the indigenous peoples’ community at NU. Panelists also discussed cultural and historical representation of indigenous people, saying there continues to be a lack of representation of Native American stories and history in textbooks and curricula. Bruce, a youth development specialist with the Chicago Public Schools American Indian Education Program, said he encourages students to do well in school and to stay connected to their heritage through supplementary classes, such as beading and native language. Foguth said though Columbus is a controversial figure, she reconciles the suffering of her people with the resilience that followed. She added that when she teaches children on her reservation, she challenges them to think about the meaning behind present-day assumptions and explore conflicting opinions.